Remember on Monday when I posted that I’d be spending all day cleaning the kitchen and breakfast room just to get them presentable? Well, the truth is that I worked all day, and even an hour the next morning, just on the kitchen. Cleaning the kitchen (literally dusting/cleaning everything from the ceiling to the floor) was such a big and time-consuming task that I wasn’t even able to start on the breakfast room. It was certainly convenient having a room that could hold all of that stuff right next to the room I was working on! And so nice that the room was out of the way and not right next to other rooms that we use every day. But now I have quite a task ahead of me. And this is certainly no one-day job. I’ve come in here several times thinking that I was just going to tackle it. Just start picking up, cleaning up, and organizing. But so far, every time I’ve gone in there with that idea, I’ve walked out without accomplishing anything at all. I just stand there and stare…and then leave feeling a bit overwhelmed. 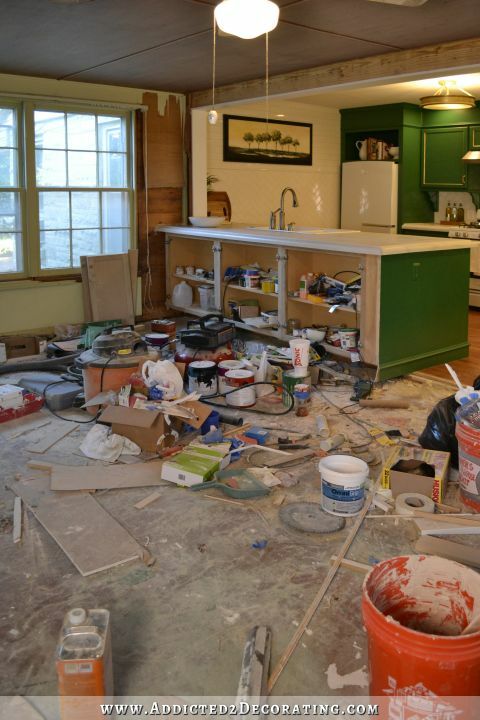 So, welcome to my not-so-pretty reality — the aftermath of my 7-month kitchen remodel. And this is after my mom spent at least three days over here during the remodel bagging up debris and taking it out, and organizing things for me. I’d hate to see what it would have looked like if she hadn’t done that for me! But even through all of the mess, I do still like to come in here and dream of what the finished room will look like. That wall between the windows in the picture above is where the fireplace will go. Those windows look out to the back yard. And this is the door (just to the right of the ladders) that leads to the sunroom. It’s the door that I’ll close up. It’s not needed, and just interferes with the furniture arrangement I have planned for the sitting area around the fireplace. 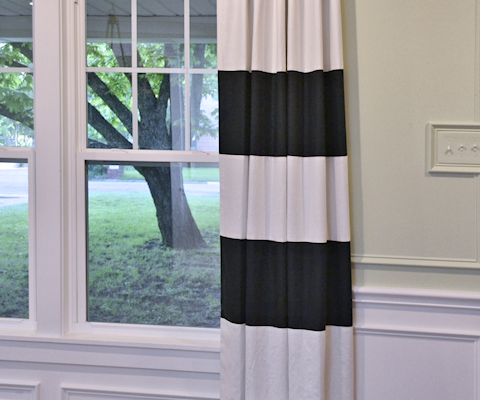 And these windows look out to the front yard. 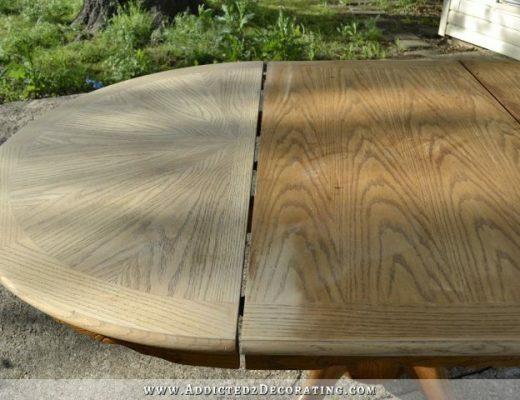 Our dining table will go right in front of the windows. I think this will end up being one of my favorite spots in the whole house. Let this also be a lesson — on blogs you don’t always get the whole truth. Those perfectly styled rooms with nothing out of place are generally not reality. And even if they are the reality of the moment, they certainly aren’t indicative of what’s going on in other parts of the house. You never know what’s lurking just outside of the camera frame. Next Post Original Kitchen Inspiration...From 1960 Paris? Haha, this looks just like those sitcoms where you see a house and if you step back there’s a set and everything is different! But in all honesty Kristi, it’s not that bad, it could be incredibly worse. Just decide on where you want your tools to go and start picking those – it will be a start. Or if you can’t decide on a start, just go in there and do whatever. Without a plan. It will come to you. You just got to beat the “standing-still-overwhelmed” phase. You can do it! I just love the wood in the breakfast room. 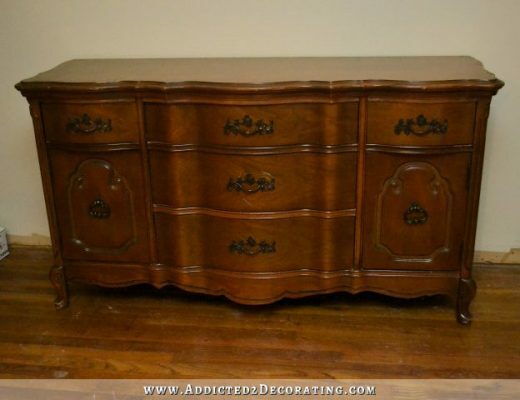 If you were going for a rustic look……. Ohhhhh. But anyway I cannot wait to see the transformation. As to cleaning. Try working in one corner and clearing it out. It will be a small area but you can look at it and it may inspire you to continue. As you probably know once you start you will get on a roll and get it done. Thanks for the honesty. The view from your breakfast room into the kitchen is beautiful! Love the big bank of windows. Just pretend we are all in their with you while you’re cleaning up cheering you on! I was thinking the same. Didn’t see any of the mess because the kitchen is so pretty. 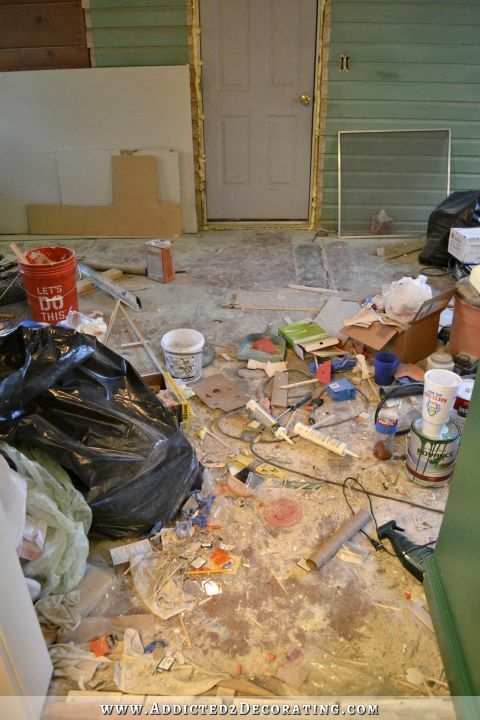 That big mess just comes with the territory of remodeling. You will get it straightened up in no time. I have a question about the breakfast room. Was it added at the same time as the sunroom? If so are you going to be able to tear off the sunroom like your planning without destroying the back of the breakfast room? These pictures made me start wondering. I love how big the breakfast room is and and love the windows also. Love the view of the kitchen from that room! I never realized there were so many windows in that room. When you posted that you were going to do the walls black, I thought it would be like a big dark cave but with all that natural light, it will be beautiful. It’s nice to see both sides and I like the ugly truth. The kitchen is so beautiful and I would love sitting at a table in front of those big windows you have. I hate to clean, so I would be tempted to hang plastic to protect the newly cleaned kitchen from getting another coat of dust when clean-up begins. It will cut the next round of cleaning in half. I love the plan you have set in place and can’t wait to see those black stenciled walls. And the view INTO the kitchen is nothing short of amazing! I keep going back and looking at it. Maybe you need a little time to catch your breath and regroup. Get your mental energy back. Totally agree with Susan’s comment!!! See now, I look at that mess and salivate. I love a cleaning challenge and honey, if I didn’t live 2000 miles away, I’d be over there happily cleaning all that up for you! Of course, that is not a very nice way to tease you, sorry. but I agree with you that the breakfast room has the potential to be the most loved and used room in the house. Especially when you’ll be able to look back at that GEORGEOUS kitchen! You’re awesome!!!! Do you know why I like your blog? because you’re human. most blogs are super fake and unrealistic. Keep it human! I appreciate your willingness to display the mess that alot of others try to cover-up. 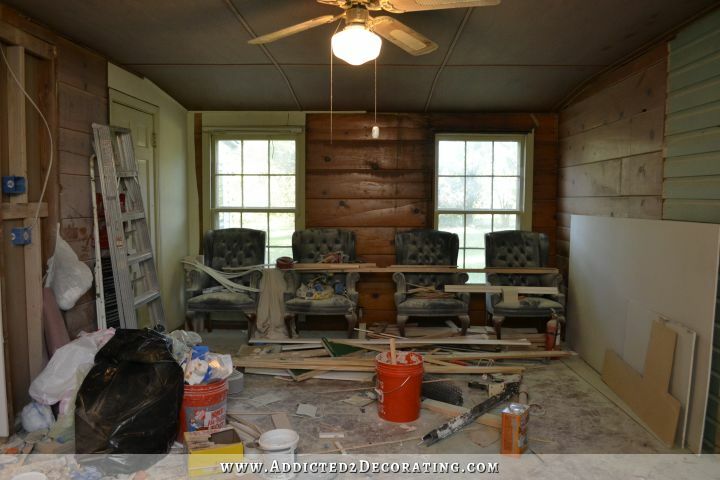 I’ll be going through a renovation shortly so your candor is helpful. On another note though, your kitchen turned out so beautifully! So just take the mess one day at a time and concentrate on enjoying your kitchen masterpiece. Yikes girl!!! And now I know why I always clean as I go, or at least every day or two. I am with you Glenda. I would be so overwhelmed by the mess I was creating that I would not have been able to focus on the kitchen I was creating. However, you did give me a terrific idea of what to do with my long hallway (paint with flat paint and stencil with a gloss). I can’t do black, but I can’t wait to see how yours turns out Kristi. Promise yourself you only have to clean for half hour chunks then you can have a “reward” (cup of tea, do some research for your room) for half an hour. Turn up the music and go girl. Half an hour that’s all you need to do (you know that once you see progress you will be so keen to keep going). Just do it! I love the pulled back views of the kitchen. 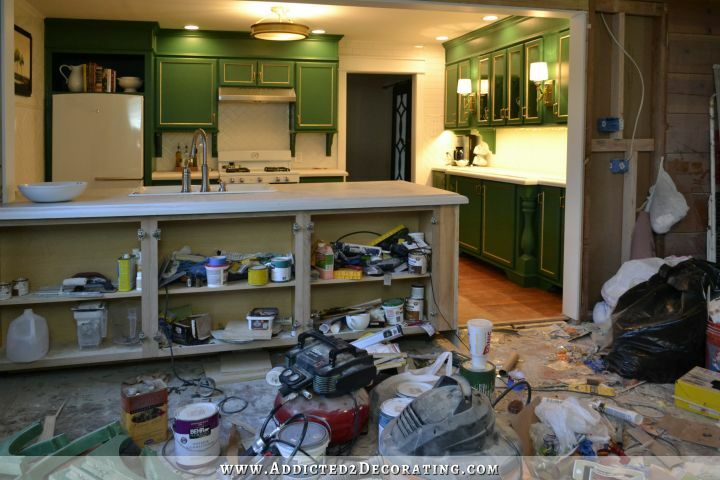 I also love seeing the contrast between the done kitchen and the completely undone breakfast room. I am excited for when you will be working on that room. You will probably feel so much better when it is clean! I love how you keep it real …. we all know those other blogs have rooms/areas JUST like this – they just don’t admit it! My garage looks like this … and the basement … and the guest room closet. We can all relate! You’ll clean it up when you get motivated …. just do one thing at a time (put all the paint away, stack the lumber/wood, tools in the right place) and then it will be a manageable job. Or take a nap and pull a Scarlett – worry about it tomorrow! 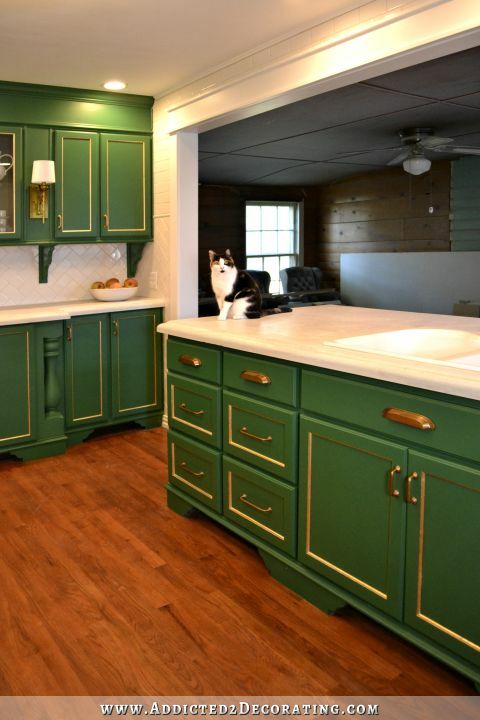 Love your kitchen remodel. Almost my entire house (including the basement) looks like your breakfast room. We are remodeling our home to put up on the market next year. I am the oldest of five children so I’ve learned to be “flexible.” You have to have vision to look beyond the mess & see the end results. Everything will come together in the end & be worth the mess. We did a major home improvement project a few years back. My cousin is a master carpenter and tries to be neat and tidy while working. Note, I said TRIES. When he would leave for the day, my 3rd grade son and I would clean-up the area. We put all tools on one side of the room, swept and vacuumed the sawdust from the floors, and had the place looking good for a fresh start in the morning. I love the clean-up process and it was a good time for my son and I to work together. Wish I could come help you. Your kitchen looks amazing and the breakfast room will, too…soon. Keep up the good work. YOU are amazing….your work is fantastic! Unique! and Gorgeous! This is one of the reasons I love your blog! You keep it real and that is so inspiring. Incidentally, I have a spare room that I can’t even get in there is so much “stuff” in there. Like you I open the door and just stand there, sigh, shut the door and walk away! I don’t even know where to begin or where I can possibly put all that “stuff” when I try to clean it! Anyway, thanks again for sharing the whole, true picture!! Kristi, I know what you mean…walk into the room and walk out. I had somewhat the same situation last April/May. I lived with my mom (age 88) and had to clean my mom and dad’s house while he was recovering from heart surgery in rehab. I’d walk into the back door and have that gut sinking feeling each time but I realized I had to take a small area, clean it and see the results and then go onto another area. At the same time, there was a complete bathroom remodel to do (bathtub to shower stall). It was a “huge elephant” but I had to as the saying goes….”eat it one bite at a time” in baby steps! 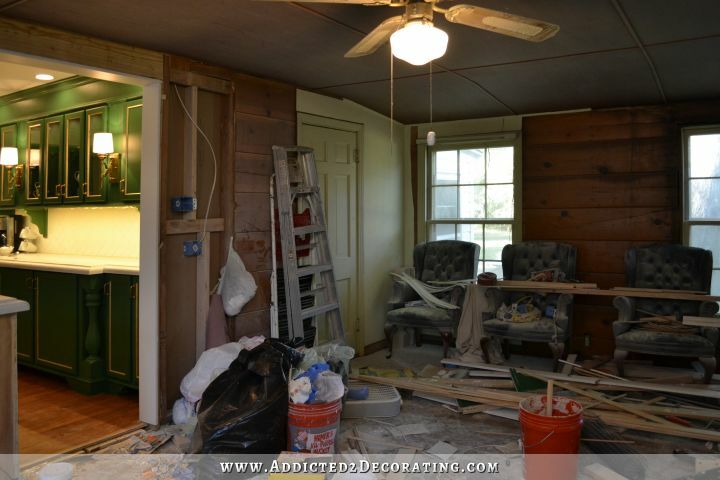 You’ve done an awesome job on your kitchen remodel and you will get this room cleaned but take just one small area at a time and it will be done in no time! BTW the weight loss looks great! Keep it up! Love your honesty! The hardest part might be picking up all the supplies that are still viable and finding a permanent resting place for them. I see that as many, many trips to wherever it is you plan to store those things. Otherwise, the actual cleaning doesn’t look too too horrible. Maybe hire a helper for 2 hours at $20 an hour? They could get a lot done in 2 hours and you’d have someone there with you. Sometimes it’s easier to tackle an overwhelming or dastardly chore when you have a work partner! the clean kitchen’, made me laugh out loud. I really look forward to your E-mails. I love seeing the kitchen from this view… BEAUTIFUL..!!! WHAT mess… lol . It is to be expected Kristi… don’t beat yourself up over it. Your breakfast room is a great size and it will be great place to sit and admire your kitchen you worked so hard on… The plans for it sounds wonderful, can’t wait to see that one too…!! Ok…I was expecting much worse in the breakfast room! Though it feels overwhelming, the bottom line is it is just doesn’t have the same payoff as seeing things take shape in the kitchen, project by project. I feel that way about my basement. Someone mentioned small chunks of time organizing (wood, cans, tools, etc. ), I think that’s a great idea. I will start one pile/one box at a time and I bet you’re going to be done before me! Your kitchen does look beautiful! The mess is just part of the process. We had a house built once, and we’d go over at night to view the progress. I was always amazed that the workers never cleaned up after themselves. And then the next tradespeople to come in would just do their thing on top of the existing mess. I’d clean up every night. I figured it was saving me money rather than paying the tradespeople’s hourly wage to do it. Plus I rationalized that they could work faster in less clutter. You know what? That mess isn’t going anywhere – just leave it alone and go get the condo ready to sell. Once you have that done, you can come back and tackle the breakfast room with renewed enthusiasm. It’ll get clean … but I didn’t even really notice it when my eyes spied through the doorway those gorgeous new sliding doors framed by the new kitchen! LOL yes when you blog you become a master at composition with the camera! Just my hobby and regular ol’ living life mess is enough! I honestly think what happens when we remodel is why I don’t do some remodels I’d like to do but that we don’t want to pay to hire out. DIY would take a long time for us and we’d be living with it for a long time. Thank you for being so real! We are in the 21st year of our 5 year remodel and I was immediately taken back to a Thanksgiving we hosted at our house in the midst of the whole main floor torn up. But…..the dining room looked great – it wasn’t finished- as I recall barely even started, but bedsheets on the wall and ceilings (applied as temporary wall paper) made the room look great. A wonderful side benefit was that it recharged my energy for the real remodel! 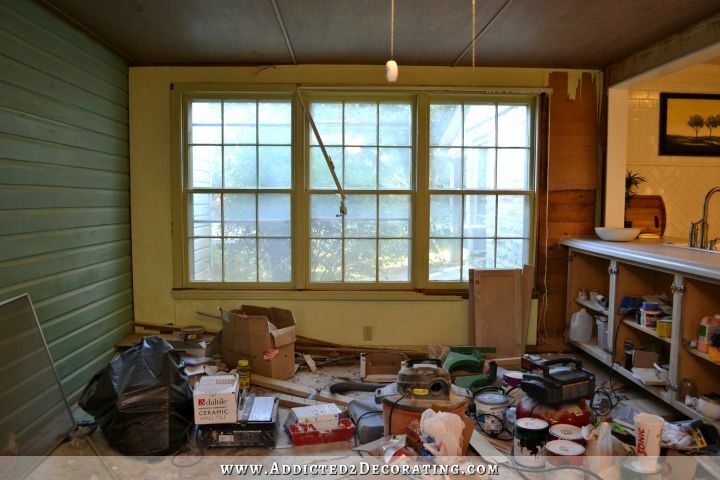 I’m pretty sure that anyone who remodels knows, KNOWS the messy room syndrome. And if they’re like me they look for eviedence of mess when I look thru magazines! God Bless. Sotrue! I understand that overwhelmed feeling and just walking out of the disaster zone – I feel that way every time I walk into my garage! I cannot wait until I see what you do in this next room. All I know is it will be wonderful, whatever you do! Oh sweet mercy, send me those wing chairs. Love love love them. Thank you! I so needed this. I have a kitchen stacked to the ceiling with furniture while I renovate my basement. It makes me feel better to know that there’s a mess somewhere hidden behind most all projects.